3 for 2 offer: add 3 of the same product with the same or different design and get the 3rd for free. The discount will be applied automatically in the basket. Our customized bed sheets are printed beautifully to ensure bright and vibrant colors, on gorgeous bed linen with color and quality that stays true. Print photos, your face or make a collage and create your very own custom bed sheets that feel smooth, cool and emanate quality. Complete your look by adding 1 or 2 pillowcases, in the same or different design. Fast delivery too. Whether you've got a fun design in mind for the bedroom, or have a unique idea for your own, all our customized bed sheets are created using luxurious cool fabrics that breath, and inks that are infused to the sheet micro fibers. We use an advanced digital printing process on your designs that only a custom maker can use. Have an interior design in mind? You have complete flexibility to design exactly what you want with our easy to use online design system. 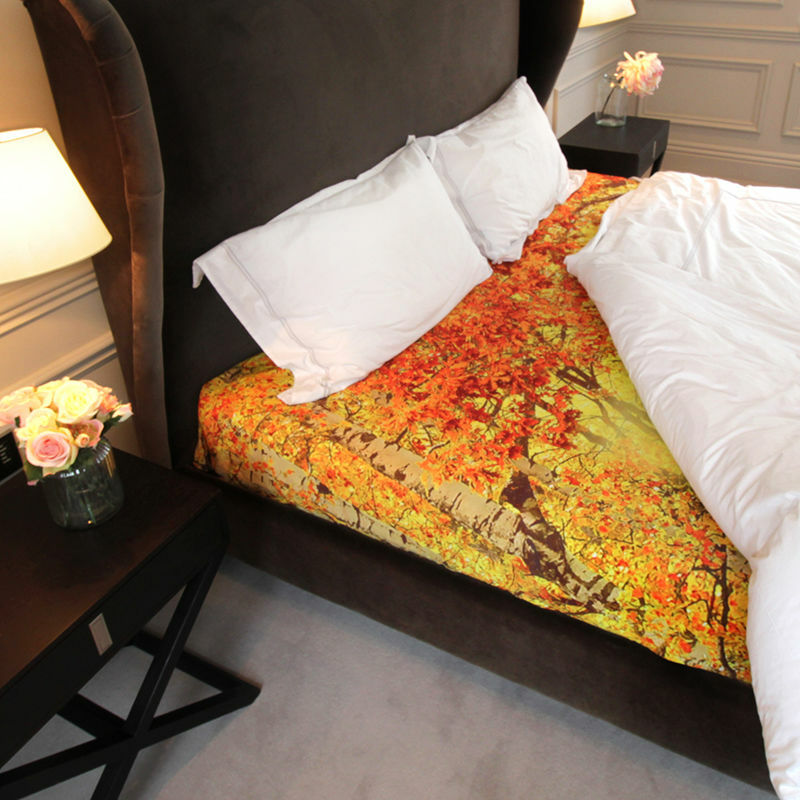 The design is printed all over and edge-to-edge, meaning there's no part of the bed sheets that cannot be customized. Our bedding, like all our textile creations, is hand-stitched in our own production facility. Design using a photo of you and your partner, a colorful print or even your face. Easy ordering, efficient delivery, beautiful and high-quality product. Thank you! Product was made per specifications and quality is good. Delivered quickly also. Its awesome I like it. Design your bed sheets with a collage of photos. Use our sheet collage maker to generate a free collage on your sheets with your best photos. Easy to design and fast too. Try our collage app for free and see your design in minutes. Bed sheet collage maker with no download, and free to try. One of the great things about our material is its cool touch and cooling attributes that help keep body temperatures in check and reduce hot flushes or night heat, especially for women. Due to the breathability and wicking nature of the bed sheet material we use, we find it helps to stay cool and encourages good sleep quality too. The pictures you choose are an added bonus. If you want to make a great bedding gift for a lady that helps stay cool and does not focus on the hot flush, but more on the picture content, then this is it. What better way to present a helpful contribution to a problem. Match your customized bed sheets with 1 or 2 additional pillowcases. Choose the same design or print your optional pillowcases with a different image. Notice About The Seams: We print on wonderful material, which comes to us on rolls that are 59" (150cm) wide. This means that we are limited in terms of width. If we are making anything that is wider than 59" (150cm), we have to have a stitched seam to sew two sheet panels together. This means each sheet has at least 1 seam. We do, however, position the seam so that it does not detract from the image or design. Care Instructions: Microfiber sheet washable at recommended 85°F, tumble dry. If dried flat, no ironing required. 3 year guarantee for print and finish quality. If you can’t decide on which photo to use, you can upload multiple images and create a photo collage. This can be done using one of our pre-set montage templates, or you can create your own entirely from scratch. It’s super easy to do and the possibilities are endless. Your photos in a grid and placed on a plain background. Your photos in a grid placed on a copy of one of the images as a background. Your photos cover the entire area and are placed on a layered background made up of copies of your images. Your photos in a heart shaped outline and placed on a plain background. Your photos in a heart shaped outline and placed on a copy of one of the images as a background. Your photos are placed onto your design for you to arrange exactly as you’d like. Step 1 – Click the start design button & select your product options. Step 2 – Go to the ‘Images & Text Tools’ tab, click the ‘add images/Text’ button on your product & ‘Select Images to Upload’ or use the Facebook/Instagram tabs. Step 3 – Choose the images you want to use for your collage, upload & select them from the uploaded photos list. Step 4 – Click ‘Create montage’ & select your collage style. Step 5 – Add the collage to your design. The more images you add to your collage the smaller each image will be. Fewer images will be larger and give you more clarity and detail. The more people in an image, the less detail there will be. If you have 10 images of a group of five friends, each person will be smaller than if you have 10 images on just one person. Try to make sure that the longest side of each image is around 3.93". There is a handy ruler built into the design tool to help you with this. Smaller products will not be able to fit as many images as larger ones will. Handmade to order by our team of expert print technicians and seamstresses, your personalized bed sheets exude luxury and charm. Printed with your unique designs and family photos all over, the microfiber fabric is cut to size and sewn together to create a truly bespoke bedding gift. For all sizes except the cot, we have to sew separate panels of fabric together, resulting in a slightly visible seam. You can choose from 4 stitching patterns to ensure your design isn't affected - see the patterns below. Create personalized bed sheets for children and get creative. Turn bedtime into something your children look forward with their very own cartoon or animal printed bed sheets. Featuring 'Goodnight (Name)' or 'Sweet Dreams (Name)' from their favorite cartoon character or pop singer, they might be encouraged to settle down and drift off to the land of nod. Design your own bedding for the kids; let them wrap up warm and get a great night's sleep in our personalized bed sheets. Print their faces all over for a laugh before hitting the hay! Printed bed sheets for housewarming gifts are thoughtful as well as practical. Do you have friends or family that have recently moved in together? Celebrate this occasion and gift them with a totally original housewarming present, you can even make a 'his and hers' bed set. Create a collage bed sheet, printed with all the happy photos, and a good luck message for the move. It's not only practical and fun, but it's a sentimental keepsake too. A bed sheet with a pattern made of a repeating face would make a great gift for someone leaving for university, or a super-fan. Design your own Personalized fleece blankets with your best images and messages; 4 sizes available and 10 year guarantee!